The West African Mudskipper (Periophthalmus barbarus) also known to tropical fish keeping enthusiasts as the Atlantic Mudskipper, is found throughout the west African coastline as far north as Mauritania, to as far south as Angola including most of the offshore islands in the Indian Ocean and into the western Pacific Ocean to Guam. The West African Mudskipper is the largest of the common mudskippers that can grow up to 10 inches in length. In their natural habitat, they are highly aggressive and intolerant of conspecifics and in an aquarium environment, unless they are housed in a very large tank, they usually do better in a single species biotope setting. Although West African Mudskippers have been found in fresh water environments, they are predominantly found in estuarine mangrove swamps where they thrive on and around the mudflats close to the water. Some groups live in tidal areas where the flats are only exposed during low tides. These mudskippers disappear into their burrows when the tide begins to rise, and emerge to forage of the mud flats during periods of low tide. Like all mudskippers, the West African Mudskipper is able to breathe air through it’s skin, and the lining of their mouth and throat. They are also capable of “walking” on land using their modified pectoral and pelvic fins. While on land, their pectoral fins can be rotated around their central axes, which allows them to “drag” themselves along through the mud. When “skipping”, the tail is bent forwards and off to one side, forming a sort of springboard which allows them to suddenly skip or jump across the mud when they flex their tails. Because West African Mudskippers can only breathe air through their skin when it is wet, their habitat is limited to extremely humid climates where they can easily keep themselves moistened when out of water. They posses enlarged gill chambers that allow them to retain a bubble of air. When on land, the gill chamber is tightly closed off by a valve in the gill slit which allows their stiff gills to remain moist. Because their gill filaments are so stiff, and do not coalesce when out of water, the Mudskipper has the ability to remain on land for extended periods of time. In fact, in terms of physiology, the gills of mudskippers are better suited to atmospheric than aquatic respiration. This style of breathing, similar to that used by many amphibians, is known as cutaneous air breathing. West African Mudskippers have attractively colored dorsal fins that they use to “flag” other individuals when they infringe on their territory or to attract a mate. They will quickly raise and lower their dorsal and often will hold it in an upright position for a few seconds to warn rivals. 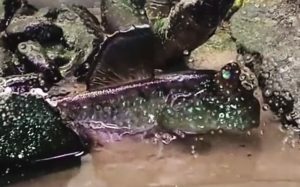 The Mudskipper’s eyes are set high on their heads giving them a 360° view of their domain. Their eyes give them a cute, inquisitive expression and in aquarium environment, they will scoot close to the tank glass to see what is going on, and will quickly recognize their keepers when they are outside of the tank. Mudskippers are easily trained and actually seem to enjoy climbing onto their keepers hand to accept food . West African Mudskippers are best housed in at least a 30 gallon aquarium (for a single fish) with an exposed mud, fine gravel, or sandy substrate “beach”, some partially submerged driftwood or bogwood , a few rocks, and a tightly closed cover to maintain the humid conditions they require and prevent them from leaving the tank. Groups of 5 can be housed in a much larger tank that gives them enough room to set up individual territories, however when crowded together, only one dominant individual will eventually remain. They can be kept with small fiddler crabs and/or guppies, mollies, smaller killifish, flagfish, etc. of the same size but smaller fish will be considered dinner. Larger crabs that could eat the mudskippers should obviously be avoided. West African Mudskippers do best in brackish water with a specific gravity of about 1.005 and although plants are not a necessity, many tropical fish keeping enthusiasts use Java Fern (Microsorum pteropus), Rhizophora (mangrove) sp., or even boiled plastic plants for esthetics. Like all mudskippers, West African Mudskippers are greedy and messy. They can tolerate a wide range of water quality conditions and are not particularly sensitive to accumulated wastes in the water however, the tank mates they are housed with must have good water quality. Provide your mudskippers with a good quality filtration system and regular water changes to eliminate nitrates and ammonia, and maintain the parameters needed for the other species that are being housed with them. Outside canister filters are highly recommended for these fish. Because the natural environment of Periophthalmus barbarus is so complex and almost impossible to replicate, they have never been successfully bred in an aquarium environment or even in public aquariums. In their natural habitat, the males dig turreted shafts in the mud up to 9 feet deep where mating and care of the young takes place. Eggs are deposited in the deepest chamber of the pit and once hatched out, the female guards the young. In their natural habitat, West African Mudskippers primarily feed on crabs, insects, worms, and other invertebrates. In an aquarium environment, they will accept live worms, crickets, flies, small pieces of seafood, meal worms, beetles, small fish, crustaceans, frozen bloodworms, mysis shrimp or brine shrimp, and even flake foods. However, dried flake foods can swell up in the fish’s stomach and potentially cause bloating therefore, they are not recommended. 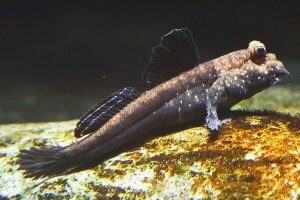 The West African Mudskipper (Periophthalmus barbarus) can be purchased from specialty tropical fish keeping shops and online from dealers and importers at reasonable prices, but before you buy one we urge you to do some research on the fish you intend to purchase, especially on the basics of caring for these adorable, very interesting animals.